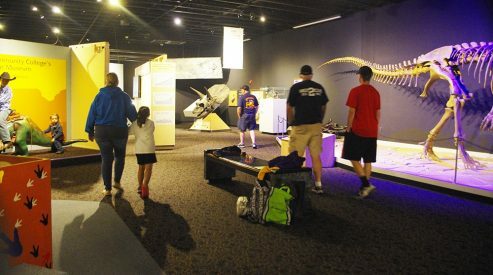 The 2016-2017 Annual Report for the Mesalands Community College’s Dinosaur Museum and Natural Sciences Laboratory, shows the Museum had a total of 13,042 visitors last year from across the nation and 45 foreign countries. The Museum also had an 8 percent increase in the number of foreign visitors last year. development, and fulfilling future goals. The information also aids in fulfilling the College’s Strategic Plan. Last year, student researchers at Mesalands presented at conferences in AZ, MN, and in NM. Research projects in biology, paleontology, ice, and water were conducted. The following researchers visited the Dinosaur Museum last year: Jack Horner, Retired Curator for the Museum of the Rockies; Dr. Jeffery Martz, Faculty Member at the University of Houston, Downtown; Dr. Donald Phillips, President of the New York Paleontological Society and Faculty Member at New York City College; and Dr. Jonathan Weinbaum, Faculty Member for the University of Southern Connecticut. The new exhibit entitled: “Life in Time” was unveiled last year. This exhibit showcases the history of sea life. The “Mesalands Student Discovery” and the “Lost-wax Method of Casting” exhibits were also updated. The Annual Report also highlighted Museum volunteers. Volunteers logged over 200 hours last year. Many of these hours went to building improvements; including painting the inside and outside of the Museum and updating the lighting in the exhibit hall.